With the two bell towers of the Cathedral guarding over the colorful stands, and mountains sprinkled with snow framing the piazza where the stands are set up, the Christmas market in Bressanone may very well be one of the most photogenic in all of Italy. 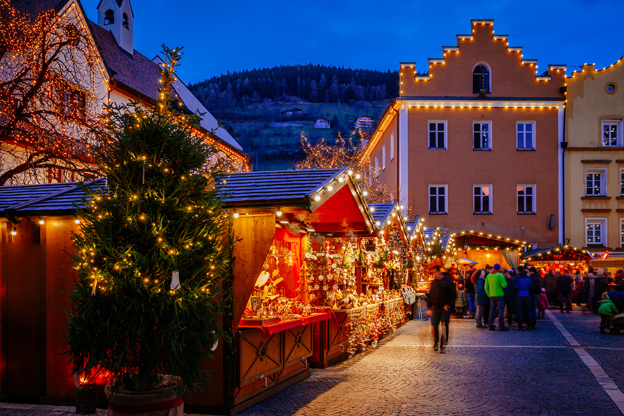 Add the Christmas lights and decorations put up in the pedestrianized streets of Bressanone’s medieval center, and even the most jaded person won’t be able to not feel at least a little bit of holiday spirit. The Mercatino di Natale (literally ‘tiny market’) in Bressanone features 37 stands offering handmade objects and crafts from local artisans that are great both as gifts and decoration ideas: nativity scenes, wooden sculptures, hand-made ceramics, aromatic candles, glass balls and angels, and more. There are also gastronomic stands, because Bressanone is, by all means, a foodie destination as well. Bressanone (Brixen in German) is located 40 km (25 miles) north of Bolzano, the capital of South Tyrol, and 45 km (28 miles) south of the Brenner Pass, the border between Italy and Austria - which makes Bressanone much, much closer to Austria than to Rome. It’s the third largest city of the province, and the oldest. 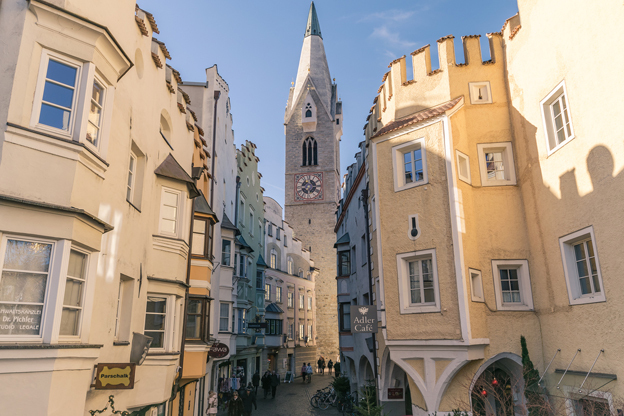 Its history goes back at least 1,000 years; Bressanone was for a long time the seat of an episcopal princedom whose influence reached well beyond Tyrol’s borders, providing a connection between northern Italy and southern Germany. Thus, there’s more to Bressanone than the Christmas market, although the shopping alone would be enough to keep you entertained; you can (and should) take some time to also explore the city’s historical and architectural aspects. Piazza Duomo, where the Christmas market is set up, is home to the city’s Cathedral, first built in the 10th century, then rebuilt a couple of times, first after a fire, then, between 1745 and 1754, with a Baroque imprint. Peek inside for a look at its 18th century frescoes, and don’t miss the cloister, with its Gothic paintings (one depicting the Three Wise Men). Just behind the Christmas market is the Palazzo Vescovile (Episcopal Palace, Hofburg in German), residence and administrative seat of the bishop-princes, an elegant palace that was used to welcome foreign dignitaries. 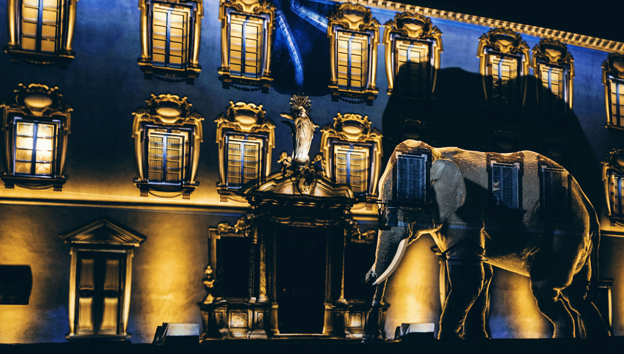 This year, for the third year in a row, it hosts the lights and music show “Soliman’s Dream,” which, using mapping technology, projects images on the walls of the courtyard’s buildings, to tell the story of Soliman, the famous elephant that visited Bressanone in 1551, just a few days before Christmas. The elephant, who came from India, was to be a regal gift from the Portuguese king John III to his nephew Maximilian II of Austria. On his way to Vienna, Soliman traveled across northern Italy and stopped in Bressanone, where he remained until the beginning of January. It was a big event for the local people, who packed the streets to witness his arrival. This year is the final episode of the trilogy of the show, presented by the French artists from the Spectaculaires – Allumeurs d'Image company. All other points of interest in Bressanone aren’t far from Piazza Duomo either; they include the Torre Bianca (White Tower), which, along with the Duomo’s bell towers, is the town’s symbol; the Museo della Farmacia (Museum of Pharmacy), which illustrates 400 years in the history of the pharmaceutical industry; and the arcaded streets (Portici Minori and Maggiori), lined with pastel-colored buildings from the 15th and 16th century, which now house fashion shops. 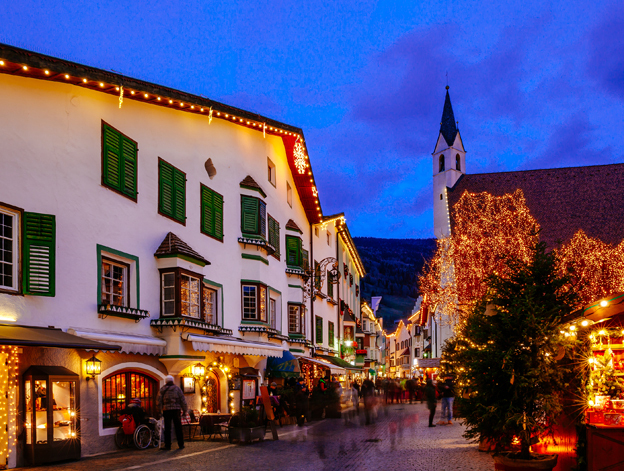 Bressanone is a good base to reach another Alpine town with a smaller but no less picturesque Christmas market, Vipiteno, which is only half an hour by train. The market is located in the Piazza Città, the village’s main square, dominated by the town’s symbol, the 15th century Zwolfertum, Torre delle Dodici (Tower of the Twelve), the 46-meter-high bell tower which still strikes the hour. The Torre delle Dodici was erected in 1469, and completed with the addition of a clock and sundial in 1473; at the time, it served as the entrance to Vipiteno. Vipiteno is part of Italy’s network of ‘most beautiful borghi’ (hamlets), and it is indeed lovely: surrounded by mountains, it features quaint streets flanked by colorful houses with the typical ‘erker’, or bay windows, adorned with flowers. The Eisack river flows through this town, settled in 14 BC by the Romans who established a military camp, Vipitenum, hence its Italian name (the German is Sterzing). The village grew along the Brenner road, an important trade and communication route between Italy and Germany. Its urban layout has remained almost unchanged since the end of the 13th century. Between the 15th and 16th centuries, Vipiteno boomed, made wealthy by the silver and lead mines of the nearby valleys. Near the Tower is the Jöchlsthurn, a late-Gothic residence, which today houses the Museum of Mines. Divided by the Torre delle Dodici into “Old Town” and “New Town”, Vipiteno has a main street, the Reichstrasse, where modern-day shops and hotels have substituted old craft workshops and inns. So again, you don’t have to limit a visit of Vipiteno to the Christmas market, but do take some time to explore its alleys and historic buildings, including the Gothic Church of Santo Spirito, with its striking 15th century frescoes; the Parish church of Santa Maria della Palude, the largest in Tyrol, featuring an altar that is a masterpiece of German late Gothic realism that has influenced the later art of Tyrol. As in Bressanone, the Christmas market in Vipiteno prides itself on offering strictly handcrafted objects from local artisans. Favorites include all-natural hangings made with dried fruits and spices such as oranges and cinnamon releasing a wonderful scent; tiny wooden elves, traditionally the lucky charm of the Alps; Tyrolean inspired place mats and pillow covers; and glass candle holders hand-painted with mountain scenes. And if you get cold, stop at one of the stands offering vin brulé (mulled wine) or apple cider. Are you in the holiday spirit yet?